Photo of area scanned. GPR used to map out reinforcing rebar and electrical conduits. Ground Penetrating Radar Systems, LLC. - GPRS - of Southern California was contacted by a local construction company at the beginning of their project to install a new hoist beam at a location in Oxnard, CA. The installation of the hoist beam required anchor bolts to be drilled through the slab and the contractor understood the dangers of drilling into a concrete slab without understanding where the structural elements are as well as potential conduits or other utilities. 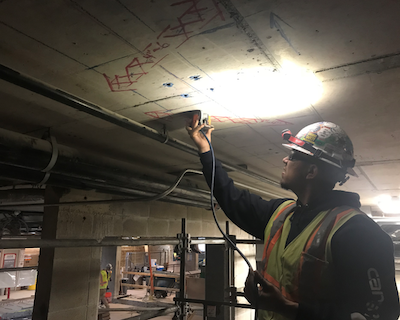 Concrete scanning using ground penetrating radar can protect the integrity of the structure as well as the safety of the cutting and coring personnel. When scanning a concrete slab, clients should typically be worried about two types of obstructions within the slab. These are structural elements and utilities that may be have been cast into the slab. Structural elements include rebar, pre- and post-tensioned cables, and beams. Depending on the type of slab and conditions of the site, GPR can help a skilled technician not only identify the location of these items, but also differentiate the most likely type of structural element. It is important to remember that this is not information provided by the GPR, rather the data given by the GPR combined with that technician’s training on the various types of structural slabs that allows differentiation to happen. While GPRS does have Project Managers with the ability to perform this differentiation, the most common scenario encountered by GPRS is one in which the client would like to avoid all obstructions in the slab. This allows for maximum safety on the project and saves a lot of effort and time on the core driller’s part by not having to run the bit through the rebar in the slab. The scope for the scan included locating rebar and locating conduits in a 50’ linear section of the ceiling and then another 10 linear feet in the other direction. We scanned approximately 2 feet on both sides of the centerline and marked all obstructions within the concrete slab. While ground penetrating radar does not necessarily show different reactions for conduits vs rebar vs post-tension cables, GPRS trains their technicians to be able to use pattern information such as depth, rise and fall, and orientation of a target in a slab to be able to identify the likely identification for each target when this information is critical to the project. For this particular project, all possible conduits were marked and labeled with red while possible rebar was marked in blue. All anomalies were marked in real time and the total amount of time spent on this project was 1 hour. GPR scanning is a great tool to use for post tension cables, rebar, and conduits; it can also be used to scan for underground utilities prior to digging or excavating. GPRS has offices throughout the entire state of California and performs projects in cities like; Ventura, Santa Barbara, Thousand Oaks, San Luis Obispo, Bakersfield, Lancaster and the greater Los Angeles area. Please contact Alfredo Espinal at 805-729-5877 or alfredo.espinal@gprsinc.com to learn more about ground penetrating radar and how GPRS can assist in your projects.